I do not know how long we will spend on my family farm in Setif before moving on to other parts of Algeria. We can stay here for at least a year learning about the backbone of Algerian cuisine, 100% bled. I will try to post at least one recipe a day, if not more. I already have most of them cataloged anyway. Many recipes will have step by step photo tutorials. Eventually I will invest in equipment to do video presentations. Every week or so I will pick a theme such as breads or couscous and explore it in detail. Or I'll pick a set of ingredients such as chicken, olives and preserved lemons and use them in different dishes to highlight the ingenuity and creativity of Algerian cooking. I will take you from nose to tail with lamb dishes and 101 ways to prepare eggs and chicken. I will cover the range of pastas, sweets, preserves and more. I will take you to France to visit Algerian restaurants, pastry shops, butchers and halal charcuteries. I also hope to take you on a trip with me to Algeria next year. All the recipes will eventually be translated into French and Arabic. The village the Zadi family farm is located in is not even on the map. We are not sure how we settled there. My grandfathers dressed in blue like the Tuaregs, my cousins wore Kabylie coats as children and we are sure we are Badwi Bedouin as well. We speak Arabic and an Arabized version of Tachawit, we do not speak any "pure" dialect of Tamazight (Berber)..
Our words for food are sprinkled with Tamazight words. We call bread made from semolina flour Kesra (bread made from wheat flour is called Khobz, Arabic for bread) and couscous seksu. My book of rai on Algeria begins in the Wilaya of Setif in North East Algeria where my family is from. Setif is south of the Babor mountains of the Kabylie. 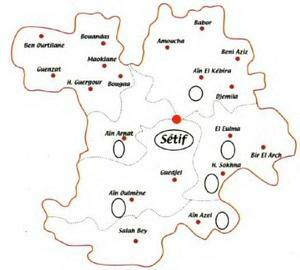 The Romans called Setif Sitfis. The province of Mauretania Sitifensis was established around 300, with Sitifis as the main city. 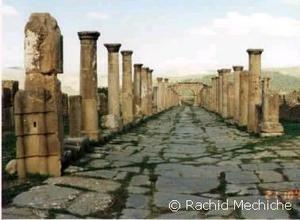 The Moderrn city of Setif was built by the French colonials. 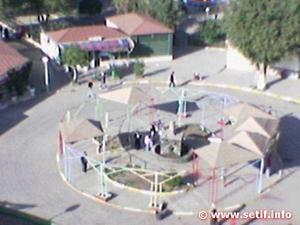 The amusement park in the center of the city is a more recent addition. There is a Byzantine ruin next to it.